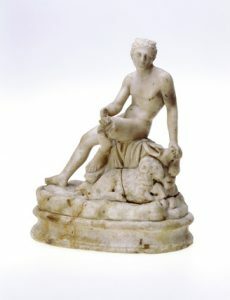 The Roman deity Mithras appears in the historical record in the late 1st century A.D., and disappears from it in the late 4th century A.D. 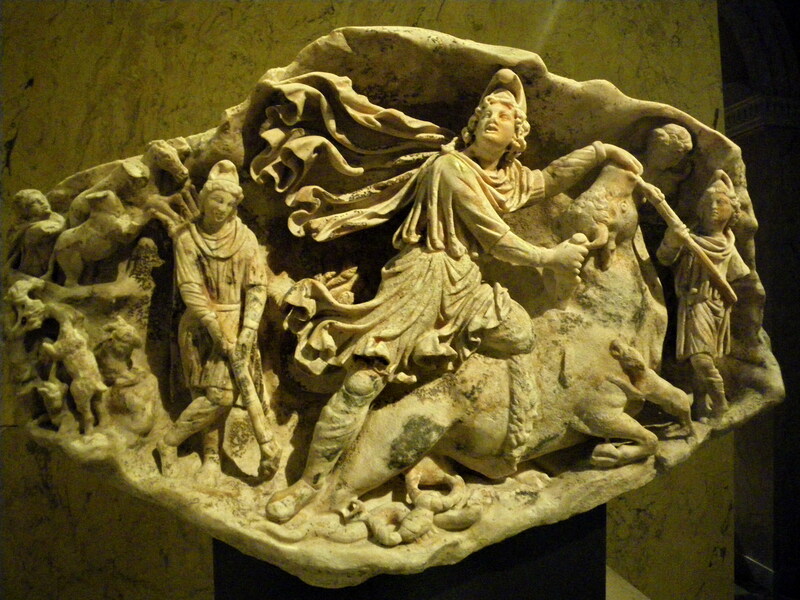 The temples of Mithras were always an underground cave, featuring a relief of Mithras killing the bull. This “tauroctony”, as it is known today, appears in the same format everywhere, but with minor variations. Other standard themes appear in the iconography. Although the exact identity of the lion-headed figure is debated by scholars, it is largely agreed that the god is associated with time and seasonal change.36 An example is from the Mithraeum in Sidon. Admission into the community was completed with a handshake with the pater, just as Mithras and Sol shook hands. The initiates were thus referred to as syndexioi, those “united by the handshake”.50 The term is used in an inscription51 and derided by Firmicus Maternus52. The Mithraic Mysteries do not seem to have had a professional clergy. No special terminology for such a position has been found on the monuments. Only the names of the grades of initiation and of the normal offices of a collegium (e.g. sacerdos, antistes, hieroceryx) are attested. No references to a profeta, patophorus, gallus or ”fanaticus” have been found. 2 Commodian, Instructiones 1.13: “The unconquered one was born from a rock, if he is regarded as a god.” Also copious depictions in monuments. 6 Roger Beck, “Mithraism“, in: Encyclopedia Iranica, 2002. 9 Roger Beck, “The Mysteries of Mithras: A New Account of their Genesis”, Journal of Roman Studies, 1998, 115-128. p. 118. 10 Roger Beck, “Merkelbach’s Mithras” in: Phoenix 41 (1987), p. 299. On JSTOR. 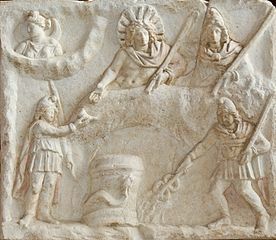 11 Manfred Clauss, The Roman cult of Mithras, p. 29-30: “Mithras also found a place in the ‘pagan revival’ that occurred, particularly in the western empire, in the latter half of the fourth century AD. For a brief period, especially in Rome, the cult enjoyed, along with others, a last efflorescence, for which we have evidence from among the highest circles of the senatorial order. One of these senators was Rufius Caeionius Sabinus, who in 377 dedicated an altar” to a long list of gods including Mithras. 22 Doro Levi, “Aion”, in: Hesperia (1944), p. 302. 24 R. Beck in response to I.P. Culianu, “L’«Ascension de l’Âme» dans les mystères et hors des mystères,” in La Soteriologia dei culti orientali nell’ impero romano (Brill, 1982), p. 302: “My other point is just to bring in a Mithraic monument, which has not so far figured in our conversations, but which I believe is of great importance, and that is the monument of Ottaviano Zeno, recently edited by Professor Vermaseren (Mithriaca IV, Leiden 1978). Its upper register contains a row of seven altars, with two Aion-typc figures, both entwined with serpents; one is winged, the other not. These two figures and their positions, the one at the extreme left of the row order, the other in the centre, allows one to speculate on the planetary order underlying these otherwise anonymous altars. Professor Vermaseren produces, to my mind, a very plausible set of identifications, seeing the Aion on the left as Saturn, and the Aion in the centre as a type of Jupiter, or rather a Caelus aeternus in the position of Jupiter (pp. 52-53). The question then arises, what order of the planets is implied for the seven altars? These are in fact more than one possible sequence, and others, of course, if one identifies the Aions differently.” No reference is given for the claim. 25 Levi, “Aion,” p. 302: “Thus Ahura-Mazda is invoked in Latin as Caelus aeternus Iupiter; and other allegorical representations of the Mithriac Caelus occur in the form of an eagle leaning over the heavenly sphere, adorned with the signs of the planets or with the zodiacal ring.” but no reference is given for the claim. Salomon Reinach, Orpheus: A General History of Religions, translated by Florence Simmonds (London: Heinemann, 1909), p. 68, also claims that Ahura-Mazda was referred to as Caelus by the Romans; again without reference. 29 Manfred Clauss, The Roman cult of Mithras, p.98-9. An image search for “tauroctony” will show many examples of the variations. 31 J. R. Hinnells, “The Iconography of Cautes and Cautopates: the Data,” Journal of Mithraic Studies 1, 1976, pp. 36-67. See also William W. Malandra, Cautes and Cautopates in: “Encyclopedia Iranica”. 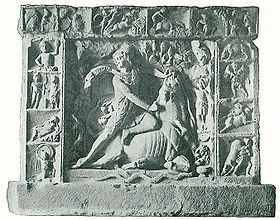 32 Roger Beck, “In the Place of the Lion: Mithras in the Tauroctony” in Beck on Mithraism: collected works with new essays, 2004, p. 286-287. 33 Roger Beck, “The Religion of the Mithras Cult in the Roman Empire”, Oxford University Press, 2007, ISBN 0199216134, p. 27-28. 34 R. Dussaud, “Le dieu mithriaque leontocephaline”, Syria 27 (1950), p.253-260. Online here. 51 Manfred Clauss, The Roman cult of Mithras, p. 42: “That the hand-shaken might make their vows joyfully forever” referencing CIMRM 423, dedicated by a certain Proficentius. 59 Walter Burkert, “Ancient Mystery Cults”, Harvard University Press, 1987, ISBN 0674033876, p.49. 62 Erika Manders, Coining Images of Power: Patterns in the Representation of Roman Emperors on Imperial Coinage, A.D. 193-284, Brill, 2012, p.130: “Sol, however, did not have the exclusive right to appear as pacator orbis and invictus on third-century coins. Jupiter, Aurelian, Probus and Numerian appear as pacator orbis too, while, apart from Sol, other gods (Jupiter, Hercules and Mars) received the epithet invictus.” References are given to coin types. 64 Roger Beck, “In the Place of the Lion: Mithras in the Tauroctony” in Beck on Mithraism: collected works with new essays (2004), p. 286-287. 69 J. A. Ezquerra and R. Gordon, Romanising oriental Gods: myth, salvation and ethics in the cults of Cybele, Isis and Mithras. Brill, 2008, p.202-3: “Many people have erroneously supposed that all religions have a sort of universalist tendency or ambition. 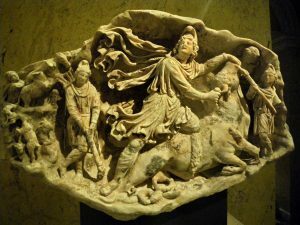 In the case of Mithraism, such an ambition has often been taken for granted and linked to a no less questionable assumption, that there was a rivalry between Mithras and Christ for imperial favour. … If Christianity had failed, the Roman empire would never have become Mithraist.” Google books preview here. Roger Beck, “The Mysteries of Mithras: A New Account of Their Genesis,” Journal of Roman Studies, Vol. 88, 1998 (1998) , pp. 115-128. Roger Beck, “Mithraism since Franz Cumont,” Aufstieg und Niedergang der römischen Welt, II.17.4, 1984, pp.2002-2115. Important summary of the changes to Mithras scholarship. Originally published by Dr. Roger Pearse at Tertullian.org, republished with permission for educational, non-commercial purposes. 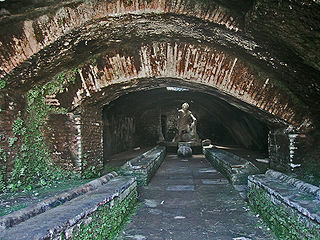 This entry was posted in Ancient, History, Mythology, Religion, Roman, Rome. Bookmark the permalink.